Surprise New Stamps in ANZAC Minisheet? 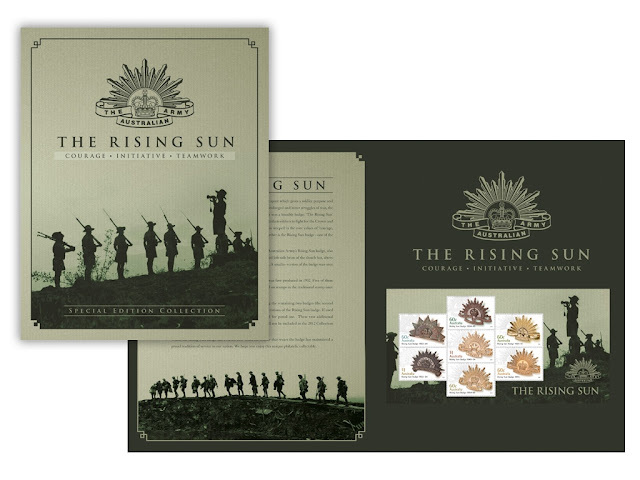 If the image on Australia Post's website is correct the semi-imperforate ANZAC miniature sheet contains a big surprise - two $1 stamps. Australia Post has confirmed this is right, but as I have yet to see one 'in the flesh' it will be interesting to see if the same perforation comb was used as the perforated miniature sheet. If so it means the two $1 stamps will be completed perforated, which means they can be removed from the sheet and used for postage. I'll update this listing when I see the actual pack. Australia Post has released a list of new issues for May and June 2012. Nice to see another issue in the Farming Australia series, and two more territorial issues. The next Stamp Bulletin should be available soon.